Buy Online or Call 01924 360 260. Pumaspeed are the Official Ford Distribution partner for the UK We Export all Milltek Sport Stainless Steel Exhausts Worldwide ! 1st prize 20% off your order. The Pumaspeed Team can service and maintain your vehicle. For an appointment please click here. Class Quality and Guarantee of the Milltek Sport Brand. Release the Flow fron the new Mk3 Focus ST 250 Ecoboost engine with a milltek Sport De Cat downpipe. The Original Catalyst and down pipe of the New Focus ST 250 ,unlike the older ST225 and Focus RS mk2, are made in one piece. This new one piece design features restrictive bends and an exit bore size of only 55mm,which is nowhere near the optimum flow rate of the Borg Warner Turbocharger. The larger bore size of the new Milltek Sport 200 cell Sport Catalyst Down Pipe has over 50% more capacity, it will add flow and power to any New 2013 spec Focus ST.
Get ahead of the game with Milltek Sport. The Pumaspeed Workshop team are ready to fit the Milltek Sport Focus ST 250 Cat Replacement Pipe (Decat) in our Head Office located here. We estimate the labour time to be approximately 1.20 hour(s) costing £93.60 inc VAT. Therefore making parts and labour a total cost £373.60 (inc. VAT). Please don�t hesitate to contact us on the phone number above or click here to email. Note: The fitting cost quoted is an estimate based on our Ford tuning experience. Please be aware that on rare occasions problems can occur that are out of our control; such as seized or snapped bolts due to age or wear. We work swiftly but in the event of an issue we may have to levy the fitting charge based on the time taken to rectify any unforeseen circumstances. 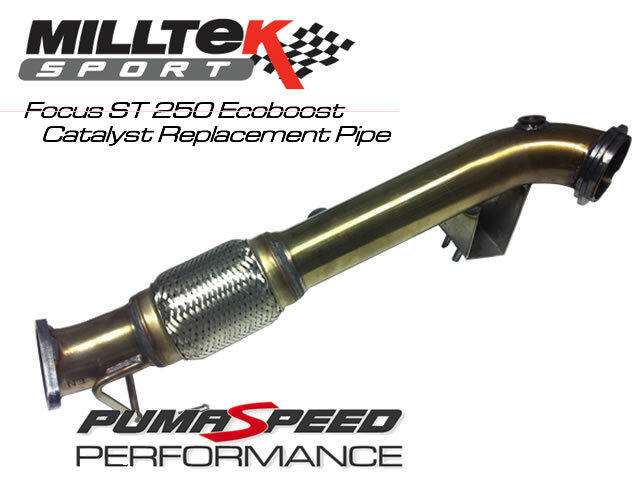 Pumaspeed have a specialist distribution team that can dispatch the Milltek Sport Focus ST 250 Cat Replacement Pipe (Decat) to any destination worldwide. Please select the delivery country from the drop down list below to see the express delivery charge and set your shopping cart to the correct VAT rate. Pumaspeed have a specialist trade distribution team that service many of the Motor trade specialists throughout the UK, the EU and the Rest of the World. From a simple email tune file to a huge shipment of Milltek Sport Exhaust Systems. We have an expanding portfolio of new brands and products combined with the experience and ability to provide what you need. To register your interest as a company click here. To post a review to our Facebook page, please click the Facebook Log In button above. Next type your Email or Phone and associated Username into the popup login panel and click the Log In button to sign into Facebook. Finally type your review in the box provided below and click the Post Review button.